Courtesy of SINGH REALTY & MORTGAGE, JATINDER SINGH. Executive VIEW HOME! Former model home 4815 sqft with almost an acre lot is beautifully appointed with designer touches throughout. The grand foyer with the winding staircase centers the home’s entertainment area’s as well as the downstairs office/library, family room and luxury kitchen. The Chef’s kitchen has an abundance of cabinets and enough room for the entire family with large center island to help out with room to spare. The open concept kitchen and family room leave plenty of space for family night or just hanging out. Double oven, double dishwasher and high end appliances with industrial size refrigerator. For formal entertaining, this home offers a formal dining area as well as a living room with a fireplace. A well appointed office sits off the foyer. There are 4 bedrooms and 4 baths and walk in closet. Perfect for your guests, though they may not want to leave! The master suite offers fireplace and view balcony. A perfect spot to watch the sunset to relax. There are extensive built in’s throughout. Main area floors are marble, bedrooms and stairway are carpeted. Beautiful tile and stone in baths. Builder added tons in upgrades and in addition to builder 8217;s upgrades, seller added another $200,000 in upgrades. 3 car garage with a drive through and a finished epoxy garage floor plus seller added another permitted garage at the backyard. Fabulous!! Solar leased and must be assumed. Please, send me more information on this property: MLS# IV19056096 – $949,000 – 16898 Nandina Avenue, Riverside, CA 92504. 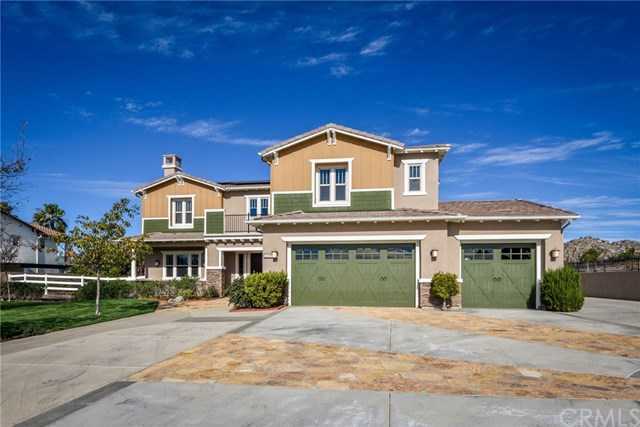 I would like to schedule a private showing for this property: MLS# IV19056096 – $949,000 – 16898 Nandina Avenue, Riverside, CA 92504.